Phillip Weston Green is one of the men whose military record was found by Trevor Lewis and Sheila Marriott, to whom we are grateful. He came from Plungar, near Bottesford. He was declared killed in action in May 1915, and has no known grave. Phillip Weston Green was born in 1884 at Plungar, Leicestershire, and baptised on the 28th August, 1884, the son of Richard Weston Green and Louisa Sarah Green. In 1891, his family lived on Chapel Street, Plungar, when his father was a wheelwright. The connection with Bottesford seems only to be that he gave his home address as Plungar, Bottesford. In 1901, on census day he was with his family at 232 Stockbrook Street, Derby. Richard Weston Green was a 50 year old carpenter, Louisa was 46, Phillip a 16 year old moulder labourer, and there were also Alfred (11), John (9), Joseph (7) and Harold (5). Phillip Weston Green attested at Derby on the 25th April 1904 as 9320 Private, having already been part of the 1st V/B (Volunteer Battalion) Notts & Derby Regiment. He was an eighteen year old ‘moulder’. On the 12th February 1906 he was declared “fit for India”, and in September 1907 he was in Bangalore. His contract was renewed on the 25th April 1909. In 1911 and 1912 he suffered injuries to his right knee. On the 18th March 1912 he was brought home prematurely from India. 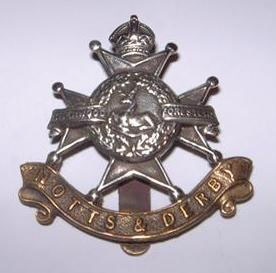 He was mobilised again at Derby on the 5th August 1914 and posted to the 3rd Battalion. There is then a record of him being ‘awarded’ ten days Field Punishment No.2, 24th January 1915, “being out of bounds when a defaulter and attended hospital … drunk in a café about 7pm”. Even so, he was promoted to Corporal, unpaid, on the 10th February, 1915, before returning to Harfleur on the 6th April. Sadly, he lost his life soon after, declared KIA on the 9th May, 1915.